They see a swim top with a zipper down the middle that looks like the perfect swim tank for the pool or the beach matched with a pair of fitted swim shorts. 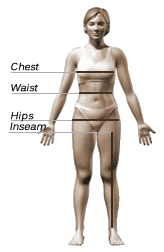 What they don't see are the inner layers of compression power binding your chest and shaping your body. We concealed the power inside so you can now enjoy your freedom without the layers of disguises. With an SPF 50 rating for UV protection, the special microfiber fabric on the outside is strong and smooth and moves with you like skin. An inner pouch makes you more comfortable in your swim shorts. In all seriousness, it is indeed amazing. For a decade I had avoided pools and beaches as much as I could, I hadn´t realized how much I actually missed it until I finally could go and enjoy it once again once I got this binder. It sits comfortably once you manage to put it on, and gets you flat and nice. It can ride up though, or at least mine does probably thanks to my body type, but nothing that can´t be easily solved. This is one of the best purchases I´ve made, definitely!